Meen Kuzhambu / Spicy Fish Gravy – When I think of meen kulambu, I always have the feel that my mothers is the best. Not sure whether it is of the love and affection, she add along with her cooking or it is because of the experience or the both. After marriage, though I used to ask her the recipe and do the same what she says, I feel the taste never comes like hers. Though I am little bit ok now a days, still my Father says, my type meen kuzhambu, is different from my moms. Last sunday I cooked Kerala Style Prawn Roast and Masala Fish Fry and I asked my mother to cook this meen kuzhambu and noted down each and every measurements and steps and I am sharing with you all. Now lets see how to cook, My Mothers Special Meen kuzhambu.. Lets see the cooking method of Meen Kuzhambu. 1. Wash the fish with water thoroughly and again with salt and keep it ready. 2. Soak the tamarind in hot water for 10 to 15 min at least and extract the pulp. 3. Now take the washed fish in a big bowl and add the chilli powder, coriander powder, turmeric powder and salt. 4. Mix them well, so that they are well coated and let it marinate for 30 to 40 min. 5. Now in a mixer, add the cumin seeds, black pepper. 6. Add the onions and the Tomato. 7. Grind to coarse paste without any water and keep it ready. 8. In the Kadai / wok, add the oil, and when the oil is hot, add in the cumin seeds, fenugreek seeds. 10. Now add in the tomatoes and saute them well. 11. When they are soft add the chilli powder, coriander powder, turmeric powder and salt. 12. Add in the curry leaves and saute for another minute. 13. Add in the ground paste and saute till the raw smell goes off from the onion. 15. Add the fish pieces now and let it cook nicely. 16. If the gravy is thick, add some hot water and let it boil for 15 to 20 min. 17. When the oil starts oozing out from the gravy, add the coriander leaves and switch off the stove. 18. 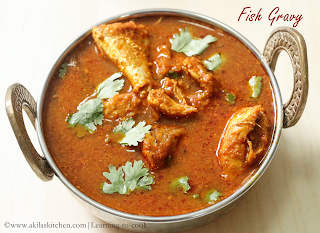 Spicy Fish Gravy is now ready. 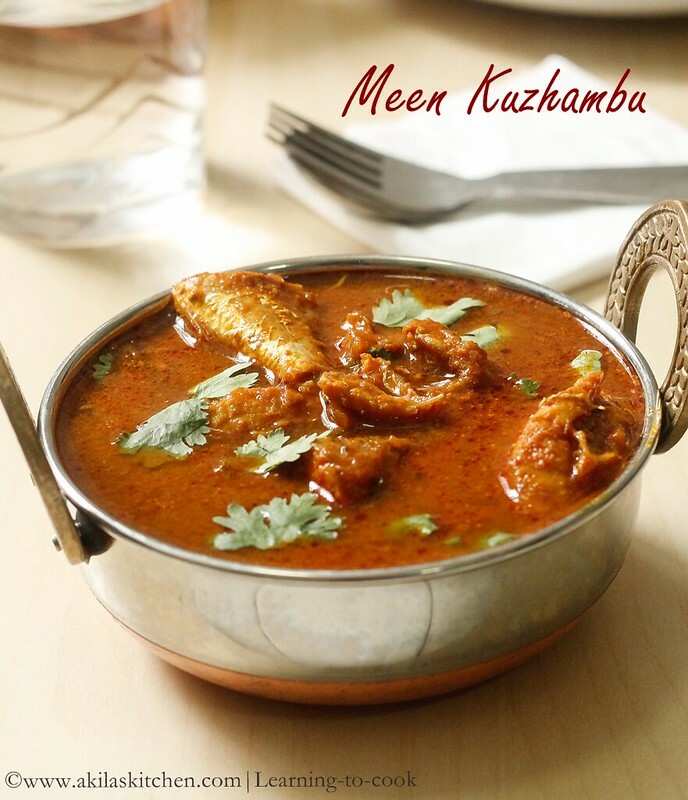 Delicious and Mouth Watering Meen kuzhambu / Spicy Fish Gravy is ready to be served. 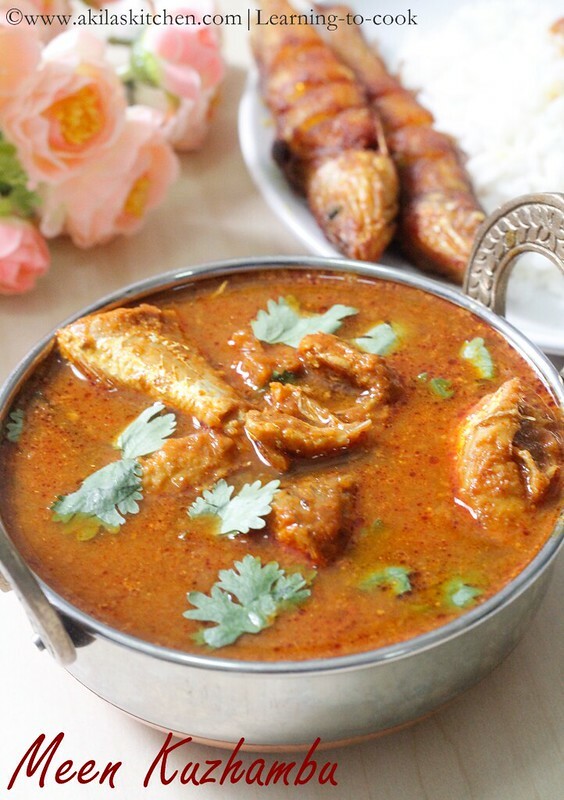 Enjoy it with hot rice….. I came all the way down searching for this comment. Fish usually cooks in 3-4 minutes anything over that will break the fishes or if the cooking is beyond the breaking stage it will get overcooked and become hard. Also it is better to roast the chilli powder before marinating so that we can avoid the raw smell of the chilli powder. Thanks Navnitz for the awesome tips. Will try frying the chilli powder and add it. Hi this is jhanani I did the kulumbu so nice. dear,i did this and came out so well.thanks so much. i always follow your fish recipe.at last i added few coconut strand mixed with some water .it was so tasty. try this last step also. Wow delicious fish kulambu. I tried it yummy it's awesome. Thank you for this recipe. Thanks a lot and happy you loved it very much 😊. Hi Buji… some fishes need more time. Also in our family we love the fish with its gravy fully gone inside the fish. That's y, after 6 or 7 min, start cooking in less flame. Thanks a lot Renuka for trying out the recipe. Hope everyone enjoyed. Last Saturday I tried this recipe and came out very well. And today I tried I became expert meen kulambu expert. Thank u so much simple steps of cooking method and clear pictorial. Thanks for trying the kulambu Pinku. Hope your family loved. Thanks Akila mam. First time ever I tried out and the kulambu tasted well all told me. I'm a vegetarian and just cook for the sake of my family. Thanks for the recipe. Thanks for the detailed step by step instructions. Tried it today and it was ok. Felt cumin flavour over dominated the recipe, otherwise it was fine. Wow stunning! Hi I have an event at my blog do check out if you can http://shobskitchen.blogspot.in/2014/12/event-giveaway-announcement-2015.html keep Blogging! I've tried it buddy, the taste is awsome. Thank you. yumm, This looks delicious, a must try. Whats the english name for sankara fish? Can I use tuna or a bigger fish for this? Tempting fish kulambu,looks so delicious. Woow Simply Superb, both in narration as well as click..
but what is sankara fish? Nice color. hope u njoyed well..
yummy yummy kulambu, Akila. very nice. hey ! i have got something for you . hop over to my space. 3 things, u get…2 awards and…a hug !!! 😉 Have a great day ahead ! 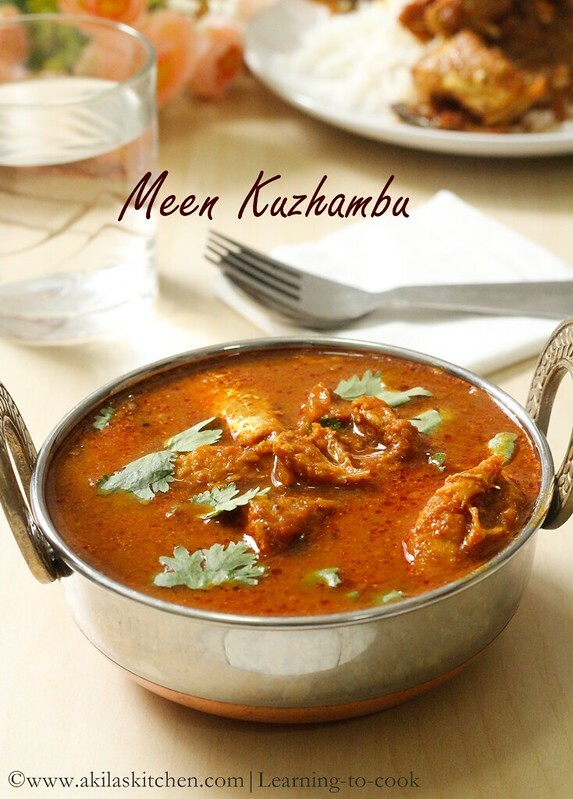 Delicious meen kuzhanbu and mouthwatering presentation. Super meen kuzhambu ! looks very flavorful and delicious ! 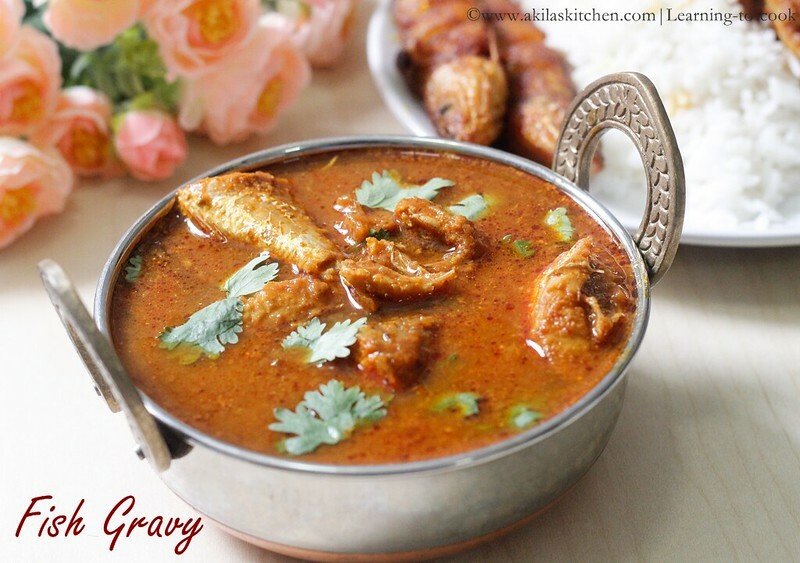 Wow that looks fabulous, loved the fish pieces peeping out of the curry 🙂 Nice clicks Akila..
wow I want that gravy! So good! This looks so good! What would you recommend as a side dish?? mouthwatering fish kuzhambu,looks sooo delicious!! Another round of another delicious fish dish. Yum to the thick curry with the fish pieces inside and yes, mums have the best recipes.